In business, your customer list and the protection of your customers from the internal workings of your company are important. This is why a sly move by Intuit has me steaming. I recently upgraded my QuickBooks software from QuickBooks 2008 to QuickBooks 2010. Normally, I upgrade every two years because of two reasons. First, based on Moore’s law, technology doubles every 12 to 18 months. That means, my software is worth very little after 2 years. If I am going to compete in an ultra fast paced business world, my business technology must be relevant. Second, after 2 years, QuickBooks software has reached the end of its product life cycle, and thus, Intuit no longer supports it. Because of this, we depreciate our bookkeeping software based on this schedule and purchase new software approximately every 2 years. From a technical point of view, the upgrade process is normally routine. There have been no “gotchas” that I have been aware of, except for this latest installment of QuickBooks. It appears that this time, Intuit is trying to promote their (I am assuming new) online payment system called “Intuit PaymentNetwork”. They are using the unsuspecting small business owner to do some of the work for them. I say this because, by default, once the software has been upgraded (or installed for new users) every receipt a QuickBooks user sends has a message embedded on receipts and in billing emails sent to their customers about using the “PaymentNetwork”. 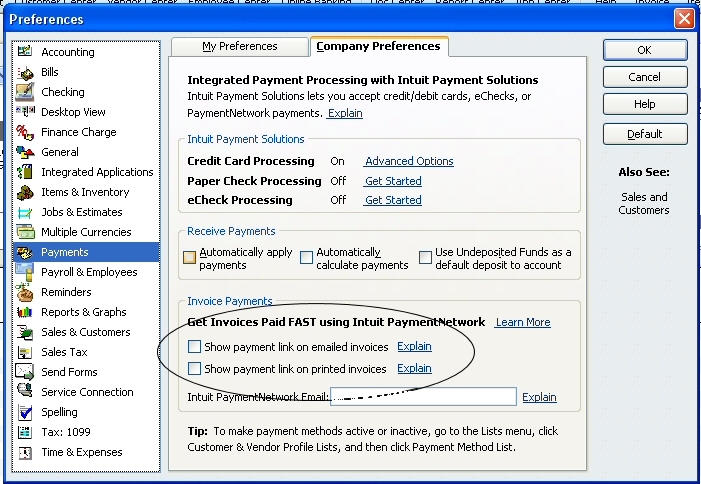 The worst part is, if your customer decides to pay you through the Intuit PaymentNetwork, they have to sign up to make that payment, and then you are charged to receive the payment. Not only have you now been exposed to their new payment system, but now, your customer has also. Furthermore, if you previously customized your receipts, your receipts will be edited in a way they/QuickBooks sees fit in order for them to pitch their “PaymentNetwork”. Software does not perform well in relation to subjective matters like the esthetics of a receipt formatting, especially when you consider the number of receipt layouts that are possible in QuickBooks. After all of this, I have not even addressed the issue of why Intuit should assume that you are not already accepting online payments through another vendor. This is yet another nuisance created by a big business that we ,the small people, must clean up. Go to the Invoicing section of QuickBooks. At the lower right corner you will see a check next to “Allow online payment”. Remove the check mark. A pop up box will appear. Click “OK”. In the menu, go to Edit>Preferences>Company Preferences. 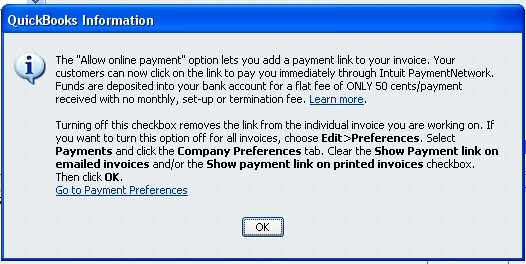 Clear the “Show payments link on emailed invoices” and the “Show payment link on printed invoices” then click “OK”. From a business point of view, this is unacceptable. I highly doubt this was inadvertent, and from a programmer’s perspective, this is not something that would be added by mistake. The last thing I need is another business using the resources I paid for to pitch their products and services to my customers. If you want me to endorse your products or services or to let my customers know about your products, I should be asked first. Until then, my customers are OFF LIMITS.